Pursuant to article 16 of the charter, the Executive Secretariat is directed by a full member elected by the general assembly. It is lead by an executive secretary who is head of the full member. The Executive Secretariat performs its functions for a six-year period, which may be extended by an additional three years, and is responsible for providing support to the various groups within OLACEFS (Assembly, Governing Board, Presidency, committees, commissions and working groups), as well as giving technical and administrative support for the implementation of their activities. Its powers and duties are defined in articles 30 to 35 of the OLACEFS regulations. From January 1, 2013, until December 31, 2018, the Executive Secretariat is being run by the Office of the Comptroller General of the Republic of Chile, the CGR. From Thursday December 17, 2015, lawyer and expert on administrative and environmental law Jorge Bermudez Soto was officially appointed Comptroller General of the Republic of Chile, a post which he will hold until December 17, 2023. He is a graduate in Law of the Catholic University of Valparaíso and holds a Master’s Degree in European Community Law from the Autonomous University of Madrid. Mr. Bermudez Soto is a Doctor of Law from the same university and pursued post-doctoral studies in Environmental Law at the German universities of Giessen and Heidelberg. He is professor of Administrative and Environmental Law at the Catholic University of Valparaiso. Mr. Bermudez Soto has been invited by the Chamber of Deputies and the Senate to participate on the Commission for Natural Resources, National Assets and Environment, on different projects relating to environmental legislation and public law. In the academic field he has held senior posts at the Catholic University of Valparaiso, particularly in the Faculty of Law where he was Director of LLM programmes between 2007 and 2011. 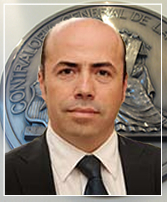 Since November 2014 he has chaired the Asociación de Derecho Administrativo de Chile (Administrative Law Association). He has also been an important participant in forums, seminars and international conferences in his field and has written numerous books such as Derecho Administrativo General (General Administrative Law) and Fundamentos de Derecho Ambiental (Bases of Environmental Law), as well as articles in legal journals in Chile and abroad. According to the provisions of article 22 of the OLACEFS Charter, the headquarters of the Organisation shall be the city determined by the full member who has been elected as Executive Secretary, for the same period during which they hold such office, in accordance with that stated in article 16 of the Charter. * Congress of Latin American Audit Institutions. ** Extrordinary Assembly 11/10/89 (Buenos Aires) to modify the organisation’s Charter and name.